Things are finally starting to warm up. Maybe spring is finally here, but I don’t want to jinx it. Our days on the lake have been fairly consistent, although there’s still been some days where the fish have been stubborn. For example, on one of our outings we managed to hook into more than a dozen fish, and then the very next day with the same group, we only hooked into a couple fish. But, that’s why they call it fishing. 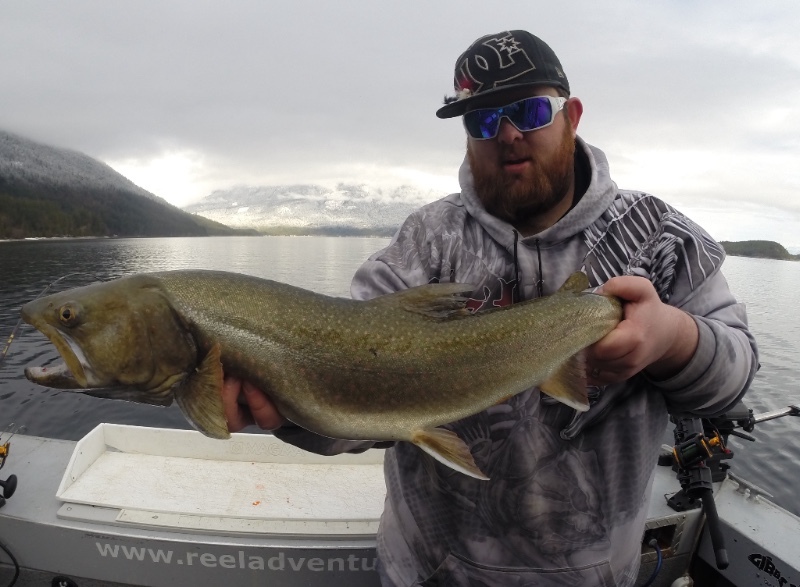 The usual Rainbows between 1 – 3 Lbs and Bull Trout between 3 – 10 Lbs have been coming in lately. So, it keeps it interesting. 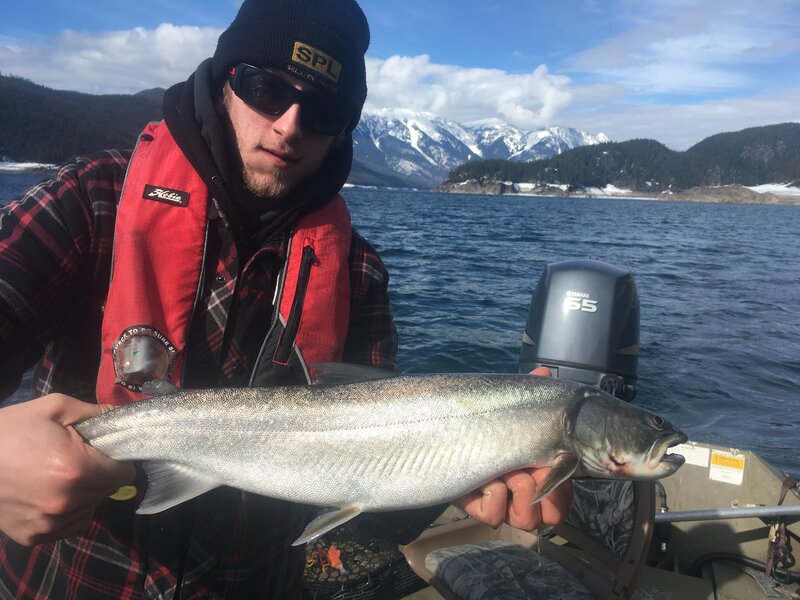 The beginning of April also saw the limited opening of the West Arm for Kokanee. The 3 day opening was hit and miss for fish and fishermen. Although the weather wasn’t the greatest at that time as well. Opening day saw a big turnout of fishermen in the early hours of the morning, and the results seemed to be mixed. Some boats had their limit within half an hour, while others had to put in their time and work hard for their fish. And the next couple days were tougher conditions, but similar results. It’s typical for this fishery to be hot on opening day and slow down on the days following. Either way, it was nice to see some life on the lake again. As the water temperatures warm up, we should begin to see fish becoming more aggressive and hopefully larger in size. April and May are usually my favourite months on the lake. The river continues to produce some nice fish. When the weather has allowed, we have been getting out a bit more this past little while. 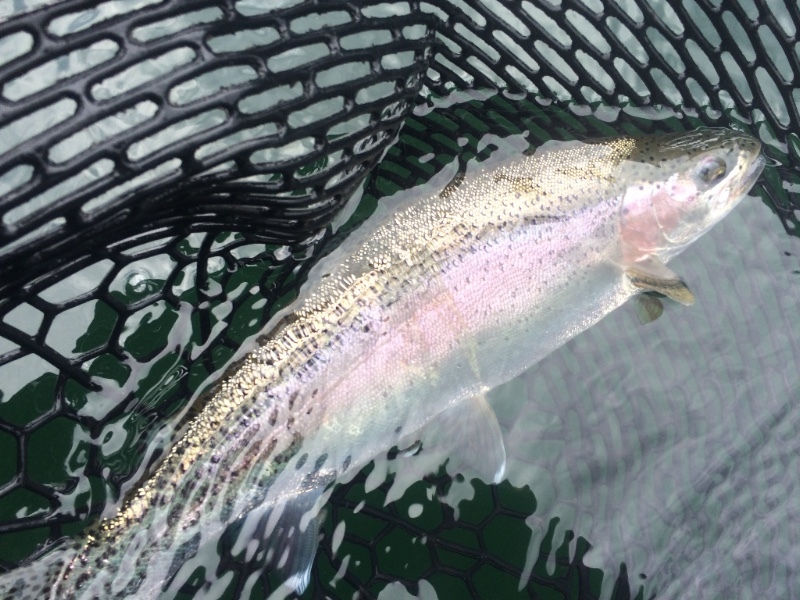 Rainbows are fattening up, bugs are starting to hatch, and things are looking up for the Spring fishery. Rainbows up to 7 Lbs have been caught lately, with the average sizes being between 2 – 4 Lbs. Columbia River clones we call them. These fish are always fat and healthy looking. And they fight like crazy. This is big fish season on the river, so stand by, because you never know what you might end up with. On the lake, it’s been best for us on our usual buck tail flies and small spoons for Rainbows. Lately the best flies have been the grey colors. #210 & 215 have been working best for us, but it still depends on the weather. Keep in mind, the rule of thumb is: lighter colors on lighter days and darker colors on darker days. But, we use grey a lot since it works on either days. Also catching quite a few on the Gibbs/Delta crocodiles in nickel/blue stripe, or Brass/fire stripe. And our Bull Trout have been biting on our favourite Gibbs/Delta flashers in the lemon lime color or STS color. Paired up with a green/glow hoochie or g-force spoon has made them a deadly combination. We are also starting to get a bunch on our favorite Lyman plugs in the original colors. Looking forward to seeing the new plugs and colors that are coming out this month. The most common depths we have been catching at lately are between 60 – 100 ft, with a few still being taken around 120-150. And on the River, we’ve been fishing either with our fly rods or spinning rods. 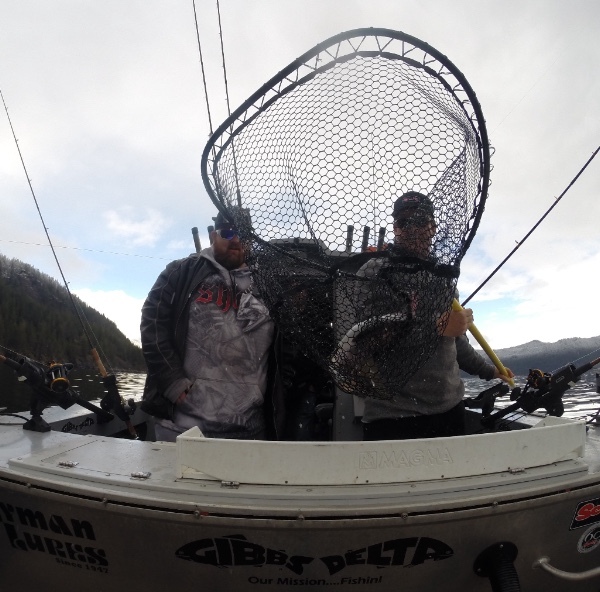 The sinking line with big streamers is producing some big fish at this time. Also looking forward to drifting some nymphs through the tail outs now that the bugs are hatching. And, on the spinning rods we have been casting an assortment of spoons, as well as bottom fishing with bait, which seems to be producing some great fish as well. Looking forward to some warmer weather throughout April. We are currently about 80% full for this season’s Salmon and Halibut fishing, so if you’re interested in joining us this summer, please feel free to e-mail me with any questions. Last summer we experienced some of the best weather ever, which allowed us to race around to our favourite spots and contributed to my best year for Halibut, as well as some great days of Salmon fishing. We’re hoping to have all of our days filled by the end of this month, so shoot me a message and I can help with planning your summer vacation.